We’ve had a lot of firsts here at Mainlining Christmas. Our first movie, our first book review, our first watch-all-the-holiday-episodes-in-a-series binge… but this one is special. This is our first Christmas movie starring Nicolas Cage. Trapped in Paradise is the story of how Erin and I were trapped in hell for a very long two hours. 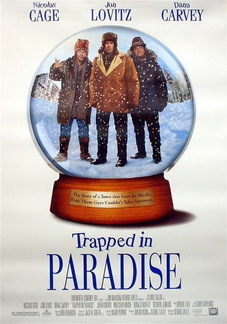 The movie follows Bill (Cage) and his two idiot brothers, who are getting out of prison early for Christmas. One brother (Alvin, Dana Carvey) is apparently a kleptomaniac and the other (Dave, Jon Lovitz) is a liar and schemer. Bill hates them, yet is too stupid too see through a series of pathetic ploys that send them all fleeing New York for Paradise, Pennsylvania. Ostensibly, they’re there on behalf of a fellow inmate, who asked Dave to intercede with his estranged daughter. In fact, they’re there to pull an easy bank job and steal the town’s Christmas fund. Or something. The explanation for what the money is and how the town functions is pretty thin. After they steal the money, an action which Bill, the supposedly law-abiding brother, not only participates in but is instrumental in planning and executing, they try to get out of town. A series of boring misadventures befall them, and they are unable to leave. First they drive off an icy bridge and wreck their car. They manage to find shelter at the bank president’s house, and begin to learn that the people in the town are unusually kind. Also, there is an random love interest shoehorned in. I haven’t mentioned Nic Cage in a while. He’s doing his thing, when his thing was to pretend to be an actor by acting differently in every single scene. Erin and I seriously suspect this was written and directed by committee, and with Cage involved, you can add that it’s seemingly acted by committee as well. The bank president lends them money for bus tickets, but bus passengers are being searched by an FBI task force looking for the stolen money. They also have to dodge some bumbling local deputies who want to steal the money for themselves. They steal a canoe and try to escape by water, instead going over a waterfall to be rescued from the icy water by kindly townsfolk. They steal a goddamned horse-drawn sleigh, but can’t in good conscience abandon the horse. In the meantime, the felon who had always intended to rob this bank has seen the heist on the news, escaped from jail, kidnapped the main characters’ mother, and is on route to Paradise. Several times while tolerating this series of scenes I entertained the dream that the ending reveal was going to be that they were trapped in Hell. It would have been a much happier ending. In the actual ending the brothers decide to return the money to the town (by way of the church) and then after a ludicrous hostage scenario involving the bank president’s family and the brothers’ mom, the FBI takes the escaped felons into custody. I need to point out that the felons are never seen again. There are several more scenes, but it’s as though their plot was added after the ending was shot, or just that several scripts were combined and no one was paying attention to continuity. There is literally a dubbed-in voice not attached visibly to any character that mentions during a transitional shot that the felons are being taken elsewhere, as though the plot holes were papered over in post-production. The townspeople, maintaining their too-good-to-be-real schtick, refuse to testify that the brothers robbed the bank. Since the money is back and no one will press charges, the FBI guys angrily let the brothers go. And Nic Cage’s character stays in Paradise with the girl he met twice over the course of a day. Let’s just imagine that the ending pan reveals that she’s a dream and he’s really in jail, or Hell, or something like that. It would make this mess make at least a small degree of sense. As it is, it’s an utter waste of time, money, and fake cheer.